A heated debate broke out yesterday over the effect of the renminbi's value on the Sino-US trade imbalance. Renowned Chinese economist Justin Yifu Lin and leading US trade expert Nicholas Lardy argued over whether the currency's value should be increased to help reduce China's exports to the US. Lardy, a senior fellow of the Washington-based Institute for International Economics, said "the US dollar has been overvalued and China's currency has been undervalued for a long time." Addressing a seminar in Beijing, he said he didn't think the renminbi's value was the most important factor influencing trade between the two nations, however he still urged China to appreciate the currency. He also claimed the US export licence system which China has bitterly complained about is not a major factor in the imbalance. But his claims were rejected by economics professor Lin. Lin, who is based at Peking University's China Centre for Economic Research, said an appreciation of the renminbi would not necessarily benefit the US economy. Many of the goods exported by China, he pointed out, are no longer produced in the US, and if the US turns to other countries for them it will risk paying higher prices. Lin said the current deficit was caused by the different configurations of industries in China and the US, with the former producing low-tech products and the latter high-tech products and services. Appreciating the renminbi may not dampen Chinese exports, warned Lin. Some Chinese supplies are not easily replaced by supplies from elsewhere, he argued, and if the demand remains the American deficit could even expand. Lardy did accept that the trade imbalance was caused by China being the final point in the Asian supply chain, with a large proportion of exports to the US not actually produced by China. For example, 60-70 per cent of the value of China's manufacturing products is imported first and then exported after assembly. While for electronic appliances, the ratio is as high as 90 per cent, he said. But Lardy defended the US export licence system, saying: "It's very common to hear from Chinese officials that the export licence system is a cause of the bilateral trade imbalance, and I don't think this is a likely significant factor." He quoted figures demonstrating that the US Government has approved, on average, 80 per cent of applications for technology exports to China, and the value of the products and technologies that have failed to earn government approval account for only a small portion of exports. 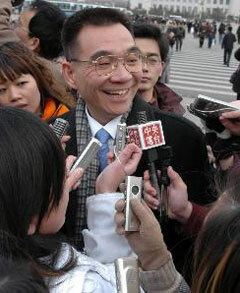 In 2005, he said, the value of unapproved technologies was about US$12 million, or 0.3 per cent of the bilateral trade. But Lin insisted that Lardy underestimated the negative significance of US export regulations on China, which he saw as a trade barrier. Despite the relatively small number of applications that were actually turned down, the system may have had a wider impact on potential export applicants, Lin pointed out. "If the US treated China as equally as its partners Japan, South Korea and others, I think US exports to China would soar," said Lin. His words follow a promise from US Undersecretary of Commerce for Industry and Security David H. McCormick in late May, that the US would "update" its export policies to China, and look for ways to reduce the administrative burden on civilian trade. Yesterday's seminar was arranged by the China Development Research Foundation, an organization affiliated to the central government. Lardy is in the country talking about the ideas in his latest book, "China: the Balance Sheet," recently published by the US-based Centre for Strategic and International Studies and Institute for International Economics. He will continue his tour at the weekend when he takes part in a Sino-US economic forum in Tianjin.